WASHINGTON, Sept. 13, 2018 /PRNewswire/ -- The United Service Organizations made history last night with the debut of its World's Biggest USO Tour – a first-of-its-kind entertainment tour with a star-studded lineup featuring multi-platinum superstar duo Florida Georgia Line. Livestreamed from D.C.'s newest concert venue, The Anthem, the event brought the nonprofit's iconic tour experience to the worldwide stage, paying tribute to service members and military families watching from nearly 90 USO watch parties around the globe. The United Service Organizations made history last night with the debut of its World’s Biggest USO Tour – a first-of-its-kind, entertainment tour featuring multi-platinum, superstar duo Florida Georgia Line. USO photo by Doug Van Sant. USO tour veteran and actor-comedian Adam Devine cuts it up with the crowd at the World’s Biggest USO Tour, a live entertainment experience at The Anthem in Washington, D.C., Sept. 12, 2018, bringing the USO mission to life and paying tribute to service members around the world. USO photo. Comedian Adam Devine and multi-platinum, superstar duo Florida Georgia Line say goodnight to guests after the World’s Biggest USO Tour, a livestreamed event from D.C.’s newest concert venue, The Anthem, that brought the nonprofit’s iconic tour experience to the worldwide stage, paying tribute to service members and military families watching in real-time from nearly 90 USO watch parties around the globe. USO photo by Doug Van Sant. Chef Robert Irvine addresses a service member at the World's Biggest USO Tour in Washington, D.C., Sept. 12, 2018. DoD Photo by Navy Petty Officer 1st Class Dominique A. Pineiro. General David Goldfein, Chief of Staff of the Air Force engages with the audience before the concert. Live-looks into three remote USO locations – USO Camp Arifjan in Kuwait, USO Yokosuka in Japan, and USO Alaska Joint Base Elmendorf Richardson – were led by General Paul Selva, Vice Chairman of the Joint Chiefs of Staff, General David Goldfein, Chief of Staff of the U.S. Air Force, General George William Casey, Jr., USA (ret.). USO photo by Cherie Cullen. 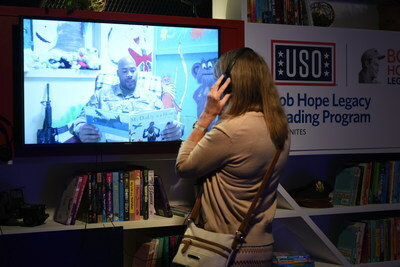 An interactive reading display at the World’s Biggest USO Tour highlights the Bob Hope Legacy Reading Program, which strengthens families by keeping them connected during deployment or other times of separation. The World’s Biggest USO Tour is a live entertainment experience at The Anthem in Washington, D.C., Sept. 12, 2018, bringing the USO mission to life and paying tribute to service members around the world. USO photo by Cherie Cullen. "Tonight's event is a new way for the USO to deliver on its mission to connect service members to family, home and country, as we bring together USO centers and performers with this single worldwide event," said USO Senior Vice President of Brand Advancement Paul Allvin. "What made it all the more special was the talent who donated their time to perform. You cannot do better than Florida Georgia Line, Adam Devine, and Chef Robert Irvine. The whole evening combined to remind us all how connected we really are as Americans, military and civilian alike." USO CEO and President J.D. 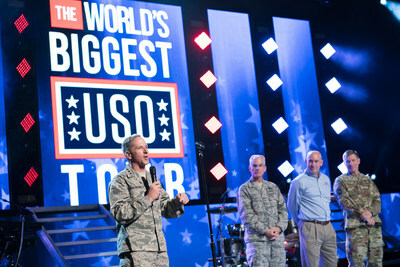 Crouch II opened the evening by welcoming the 800 guests, including senior military leadership, service members and their families, media influencers, USO partners and supporters in attendance at the D.C. concert venue. 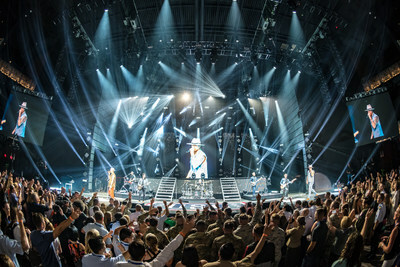 Attendees were immersed in the iconic tradition of USO entertainment tours, programs and services, while enjoying smash hits from the award-winning duo like current chart-rising single "Simple," red-hot collaboration with Bebe Rexha "Meant to Be," which has reigned the Billboard Hot Country Songs chart for an unprecendented 41 weeks, and breakout debut "Cruise." In tribute, FGL took a moment to honor the military community with "Dirt," as they regularly do during their live show. 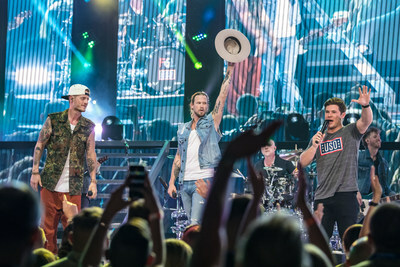 "Every single night we give thanks for our service members, and we sing this one for you guys every single show – it's powerful," FGL's Tyler Hubbard told the crowd during the song "Dirt". "So tonight, as we think about how many people are tuned into this, we want to join forces one more time, not just for the people who serve and wear the uniform but all the others who sacrifice – the wives, the husbands, their families." Before the event began, FGL's Brian Kelley also reflected on what it feels like to perform his first USO entertainment tour. "There is nowhere else we'd rather be," Kelley said. "We can feel all of the troops around the world tonight while we are playing. It's going to be special." 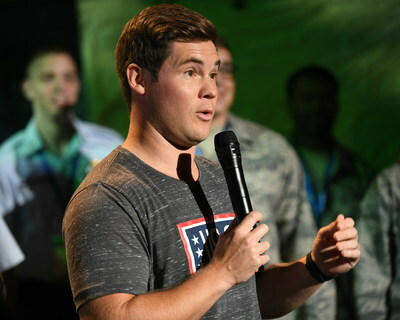 USO tour veteran, actor-comedian Adam Devine, hosted the evening's program and longtime USO supporter Chef Robert Irvine, a 14-time USO tour veteran, served as special guest. Both expressed how moved they are by the organization and its innovative tour. "Traveling with the USO has given me the chance to perform for military audiences all over the world for some of the most appreciative crowds I've even seen," said Devine, who joined the USO's 2017 Holiday Tour. "And tonight was no different for the World's Biggest USO Tour." Irvine shared in Devine's excitement around the evening. "Today is really special because we've taken the USO into what I call the 22nd century. We're going to touch people that we could never touch all at once," he said. "The concert feed is going live to bases around the world and that's why tonight is really important. It's the beginning of something really big." Throughout the evening, the crowd heard from service members and senior leaders directly impacted by the USO's mission. This included live video connections to three remote USO locations – USO Camp Arifjan in Kuwait, USO Yokosuka in Japan, and USO Alaska Joint Base Elmendorf-Richardson – led by Vice Chairman of the Joint Chiefs of Staff, Gen. Paul Selva; Vice Chief of Staff of the Army, Gen. James McConville and Chief of Staff of the Air Force Gen. David Goldfein, who thanked the USO for connecting service members back to the things that give meaning to their service. "I can tell you it personally gives me very deep satisfaction knowing every morning when I wake up that what I do really matters," Selva told the crowd before turning it over to Goldfein, who shared his support for the military support organization. "At the center of the USO is a very big seven letter word that best defines why we are here – service. But, tonight is also about the first word in the USO – united," he said. "And we are united tonight in celebrating the positive mission the USO has been accomplishing decade after decade for those who serve." "The USO is continuing to improve the ability to support you and your families from the day you walk in the door at the MEPS station until you transition back into civilian life," he said. "The USO is a wonderful reminder of what's great about America – people coming together from all walks of life to give back to others who do so much for this country." The night was memorable for an estimated 10,000 service members and their families who enjoyed the tour remotely by tuning in online or hosting a watch party. A signature event at FGL HOUSE - a four-story dining and entertainment destination in Nashville, Tennessee - brought together service members and the public, representing the importance of the military-civilian connection. "There really isn't a better night at work than when you get to connect a thankful American public to the service members and families that sacrifice so much," said Kari Moore, USO center director at USO Nashville. "Military guests and their families were thrilled to be invited and delighted to learn that FGL House and the USO made this event possible for them." Did you miss the World's Biggest USO Tour? Visit USO.org/tour for a behind-the-scenes look from the event - and just as guests did onsite, you can still serve as a Force Behind the ForcesSM with the USO by sharing a message of support with service members stationed far from home and the USO will deliver them to USO locations around the globe.